After about a year of training its Watson system on more than 600,000 pieces of medical evidence and 2 million pages of medical research, IBM(s ibm) is now offering a cloud-based Watson service to help oncologists develop the best-possible treatments for cancer patients. Watson, if you’ll recall, was designed as a question-answering system that defeated two Jeopardy! champions on primetime television in 2011. A complex set of technologies including natural-language processing, machine learning and other data-analysis techniques let it understand written questions, then analyze them against the source material to find the best possible answers. In the case of cancer research, IBM is working with Memorial Sloan-Kettering in New York to load Watson’s database with those millions of pieces medical records and research that it can learn from and analyze questions against. Sloan-Kettering is also training Watson on 1,500 real-world lung cancer cases, helping it to decipher physician notes and learn from the hospital’s expertise in treating cancer. Making this service available via the cloud means it’s accessible by more doctors and hospitals that won’t have to buy a system themselves. Having to purchase, deploy and manage this type of system might be cost-prohibitive, as it takes a lot of storage capacity to handle all that data and a lot of computing power to process it in a hurry. More generally, IBM is also offering a Watson system designed for patient care, which is derived from its work with insurance provider Wellpoint. This service helps speed the approval process for medical procedures and other treatments by analyzing them against medical data as well as Wellpoint’s approval guidelines. IBM has grand plans for Watson outside health care, too. 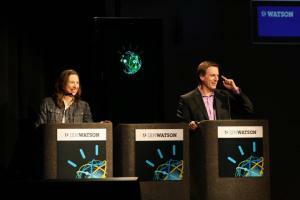 In January, for example, IBM expanded its university partnerships on Watson by giving the Rensselaer Polytechnic Institute a Watson system all its own. IBM has its own ideas for how Watson might work in other industries, and the hope is that university researchers and students will help it find even more. I knew TJ Watson back in the 60’s and 70’s……and I must say, he would love this creation by his beloved company….would love the promise of all it might do for the human race. I think Tom would love this epitaph too: ‘ Watson in the Clouds’.